Greensleeves is a detached house situated just a short level walk from the Market Square and Dartmouth town centre, set above the road within a delightful walled garden. 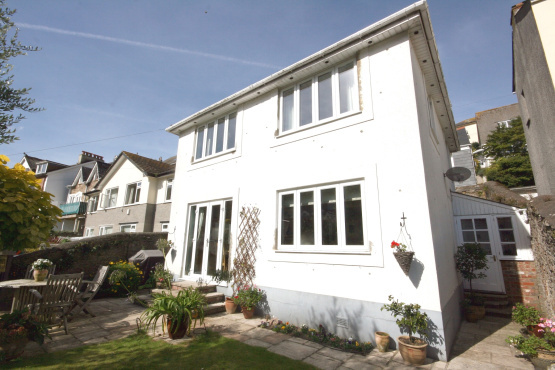 This property offers good size family accommodation with the advantage of a single garage. The ground floor provides a spacious living/dining room with direct access to the front garden through french doors. The kitchen/breakfast room is a wonderfully light double aspect room with a vaulted ceiling and fitted with an extensive range of modern units incorporating a waste disposal unit and integrated appliances. A useful utility room and a cloakroom complete the accommodation on this floor. Upstairs, there are two double bedrooms with views over the town, a single bedroom with views towards Kingswear and a family bathroom. The attractive walled garden provides a good degree of privacy and the southerly aspect ensures a sunny space to relax or dine in. This well-presented property ticks all the boxes for those wanting a centrally located home with easily maintained gardens and garage parking.